Catch of the Week: John Smith with the catch of the week or quite possibly the catch of the summer weighing in at just over 8.5 pounds. What a beautiful Brown Trout. Fishing season in our county will soon be coming to a close but the fishing in October and into November has been great and only seems to be getting better. 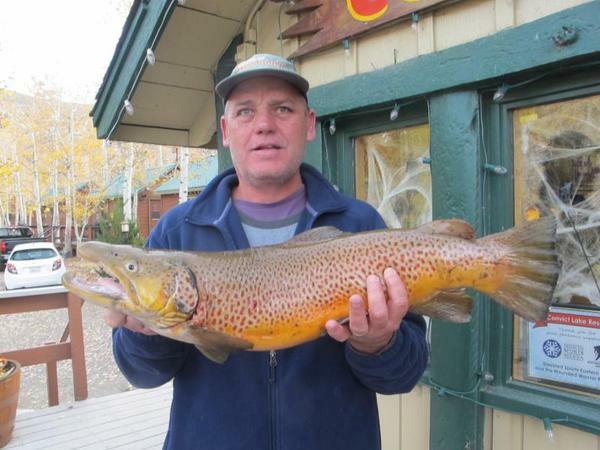 Big fish continue to be brought in as evidenced in the pictures below. The rain and most of of the wind has let up with daytime temps up into the high 50's and low 60's. That's right, the weather is great for one last push of great fishing through the 15th! The ski hill in, Mammoth, will be opening on the 10th so now is your chance to double dip and make some turns in the morning and spend the rest of the day out on the lake. We have decided to extend our bonus derby through the end of the season: Bring in a fish with one of our 2016 green derby tags in it and we will give you $50. in resort credit! Even though the marina and fishing both close on the 15th our resort stays open year-round with cabins to rent, and excellent food and beverage at our restaurant and lounge. Our general store also stays open all year long. With a few bodies of water staying open in this county for catch and release/artificial/barb-less zero limit or fly-only catch and release/barb-less zero limit depending on body of water the fun never stops. If you still want to bait fish, or bring home a couple of fillets for dinner the town of, Bishop, about thirty miles south of us has many fishing opportunities during the winter months. Being in a different county their season for most of the water is open all winter including Pleasant Valley Reservoir, which allows bait fishing and the keeping of fish. Most of us that fish on a regular basis enjoy the lower elevations in the winter months verses the summer as the temps will not be in the 90's or 100's. If you've never been here in the winter, strongly consider paying us a visit as this is one of the most breathtaking areas in the world. Luke from Redondo Beach, Ca with a fat 3pound 9oz rainbow. Cathy, up from San Diego caught this brute with a nightcrawler from the south shore! Tactics/Bait: Worm, worms, worms! Gulp worms as well. Of course lures like the Buoyants and kastmasters are still working but the majority of big fish checked in at our general store were on the nightcrawler mostly off the south shore with the inlet comming in a close second. 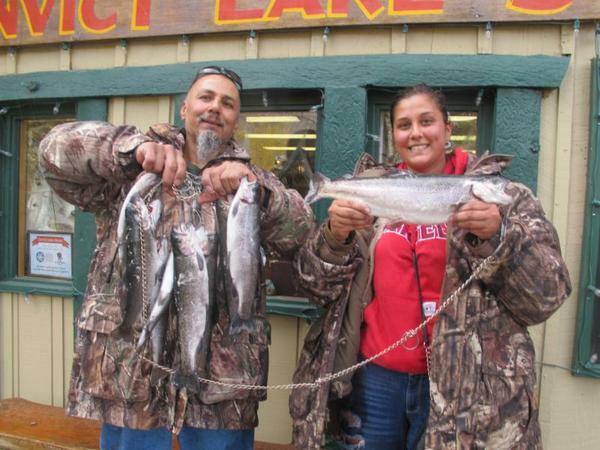 Derby News: The Ambush at the Lake Fall fishing derby started on September 5th and will run until the end of the 2016 fishing season. Don't miss out on the chance to win $6,000 in Resort prizes! We are extending the bonus derby through the end of the season:If you catch a fish with a 2016 green derby tag bring the fish in with the tag and we will give you a $50. resort credit. (must be signed up for the derby before catching the fish). The weather is almost too nice with the daytime highs creeping up into the 60's midweek. Night time temps stay below freezing throughout the week. 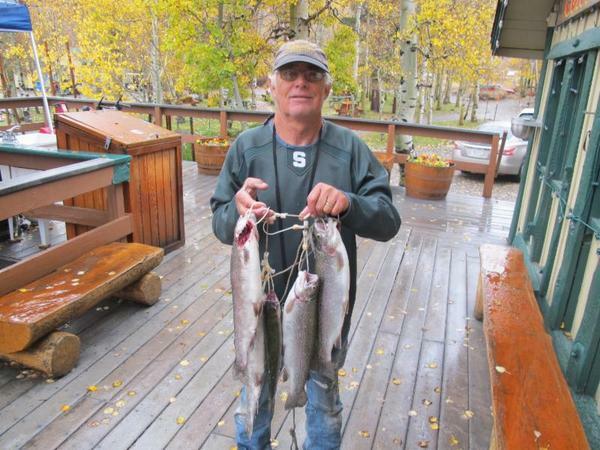 There is no precipitation in the forecast until after the fishing season closes. : 7-Day Forecast Convict Lake. Stocking: We have no more scheduled stockings for this fishing season.